According to national studies there are 17,000 new Spinal Cord Injuries each year in the United States alone. Acts of violence, primarily gun shot wounds, make up 17% of that total. The color orange symbolizes the value of human life. Hunters wear orange in the woods to protect themselves and others. In 2013, teens on the South Side of Chicago asked classmates to honor their murdered friend by wearing orange. That simple call to action has grown into a national movement and this year in recognition of National Gun Violence Awareness Day Women on Wheels took part in the movement by making orange ribbons and spreading the word. 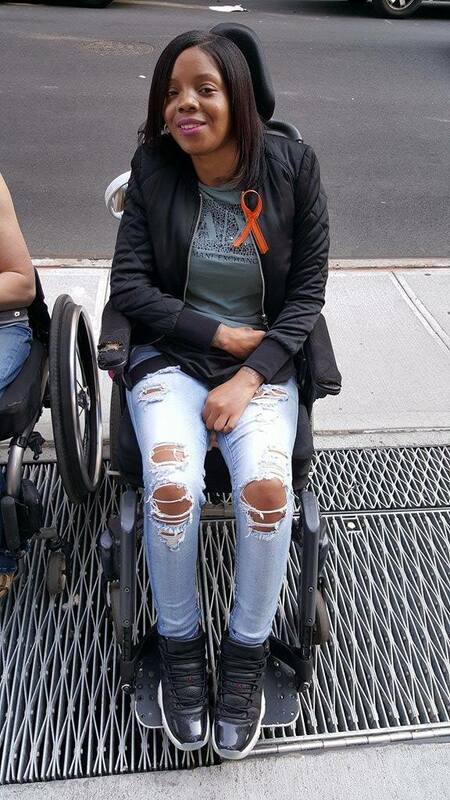 We greatly appreciate Nyree Stevens, our sister, fellow member and survivor of gun violence for sharing her story and fully support her in her courageous fight to keep rolling forward! ‪#‎WearOrange‬ on June 2 for National Gun Violence Awareness Day! Question: What do you call it when some of the top community outreach programs, agencies and vendors in the disability healthcare industry come together in one room ? Answer: Mount Sinai’s Annual Rehabilitation Fair! For the past 16 years Mount Sinai Hospital has hosted an annual Rehabilitation Fair allowing individuals with disabilities, their families and caretakers the opportunity to connect with different lifestyle providers and learn about available services, support groups, funding and more. Exhibitors from a wide variety of organizations attend the event with groups ranging in services from health and wellness, emergency preparedness, advocacy, travel, adaptive equipment, sports, and much more. This year, Women On Wheels was invited to take part in the fair and given the opportunity to meet and reach out to other women with disabilities while continuing to spread the word about our group. It was a fantastic day with entertainment provided by participants from Mount Sinai’s Wheelchair Dance Program and paintings exhibited by artist Sergio Acevedo. The group meets weekly to discuss various topics including dating and sexuality, self-image, relationships with family and friends, education, independence, co-dependence, self-advocacy, and dis/ability as identity.